Scala Sancta has an area of 1700 m2 about paintings. Some of them were already restored. • In 1990, thanks to the generous sponsorship of the PARMACOTTO, has begun the work that brought to their splendor the magnificent frescoes of the thirteenth century in the papal chapel of the Holy of Holies. • In 2000, a strong contribution of the “Getty Foundation” United States has allowed the realization of a preliminary study on the whole Sistine cycle of the Holy Stair and the restoration of the Chapel of St. Sylvester. 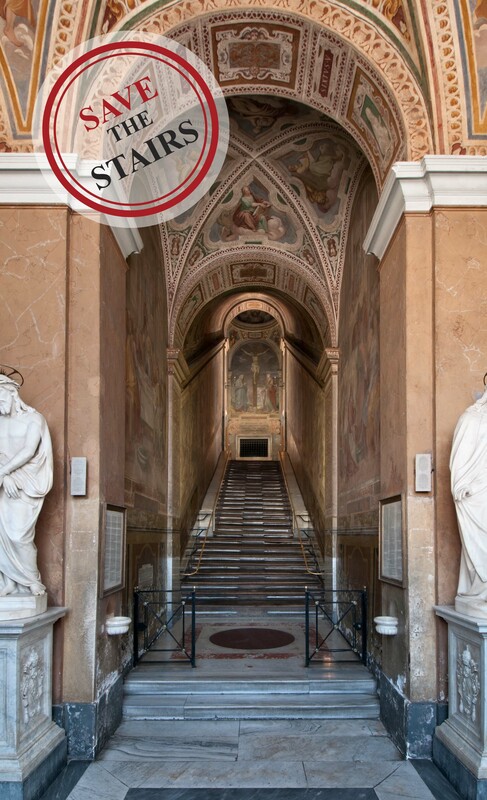 • From 2013, with the Sponsorship of the Department of Restoration of the Vatican Museums and thanks to the collaboration of the Patrons of the Arts of the Vatican Museums, have begun the restoration of the Chapel of St. Lawrence and of the frescoes of the lateral stairs. The intervention was realized thanks to your donations and to the generous contribution of the UK Chapter of London. • The Passionist Fathers, custodians of the Shrine, and the generous Gildea family participate in the works with the re-creation of the installations and with the restoration of the Chapel of the Crucifix that for Easter 2016 will have inaugurated. And, in 2014, they already executed the restoration of the paintings of the fourteen stations of the Way of the Cross and the restoration of the twentieth-century stained-glass windows. • The restoration of the Sistine mosaics was divided in three phases that expect about five years of work. Phase 1: The Chapel of St. Lawrence, in the past deteriorated for serious damage to all the frescoes surfaces that severely compromised the vision of the works, as well their artistic content. Thursday, June 11, 2015 it took place the inauguration of the restored Chapel of St. Lawrence. Phase 2: Lateral stairs, where the frescoes are almost invisible and in need of restoration, conservation and of a proper lighting. The restoration was started in March 2015. Phase 3: The restoration of the Holy Stairs itself, which started in January 2018 and will last all year. And finally, the entrance hall, where walls, floors, windows and some statuary elements need immediate attention. The ceiling must be cleaned and illuminated. Your contribution will allow to restore completely the Holy Stair, in the coming years.